Artsakh (Karabakh) was one of the 15 provinces of Metz Hayk (Armenia Maior, Great Armenia). It played a significant strategic role for the Armenian statehood throughout its history. Artsakh world (ashkhar-province) served as a shield for the central regions of Armenia from the raids of nomadic and barberian tribes from the east. For the first time Artsakh is mentioned in Urartian inscriptions as 'Urtekhe' or 'Urtekhini'. . "The Armenian provinces include Favnena, as well as Kombisena and Orkhistena, and Orkhistena provides the largest number of riders', notes Strabon. Aghatangelos (5th century) testifies that the winter residence of the Armenian kings was in Utik Province, northwards Artsakh. In the 5th century Artsakh is mentioned as 'Pokr Siunik' ('Syunik Minor'). According to Movses Khorenatsi, after young Grigoris died in the field Vatnyan his deacons took his body to Syunik Minor and buried him in the village of Amaras. Yeghishe writes that after Avarayr Battle in 451 many of the Armenians who had revolted against Persia ran away and found shelter 'in the southern and impassable lands of Tmorik and the forests of Artsakh'. Hellenic-Roman and Armenian authors testified that the River Kura was the border between Armenia and Agvanq (Caucasus Albania). Utik and Artsakh situated at the right bank of the River Kura. Claudius Ptolomeus wrote: "From the north Great Armenia borders on part of Kolkhida, Iveria and Albania, and the border passes along the River Kura". Byuzand (5th century) wrote: 'He (Mushegh Mamikonyan) established the border of his country (Armenia) and Caucasian Albania along the River Kura, as it formerly used to be". The Maskut king Sanesan 'crossed his border, the big River Kura and invaded into the country of Armenia". The political, social-economic and cultural issues of Artsakh are more expansively described in "History of Aluank Country" by the Armenian author Movses Daskhurantsi (10th century). From the Arabic dominion through the re-establishment of the Armenian statehood under the leadership of the Bagratids (885), Artsakh constituted part of the administrative unit "Armenia", and during the reign of the Bagratids was included in it. Starting from the 10th century Artsakh is mentioned in the historical works and sources by the name of "Khachen". During the ruling of Prince Sakhel Smbatian the center of the principality, i.e., the fortress of Khachen, became the princely residence. Like before, Khachen Principality remained one of the regions of Armenia. The Byzantine emperor Constantine addressed his letters to the prince of Khachen with the inscription "To Prince of Khachen, Armenia". 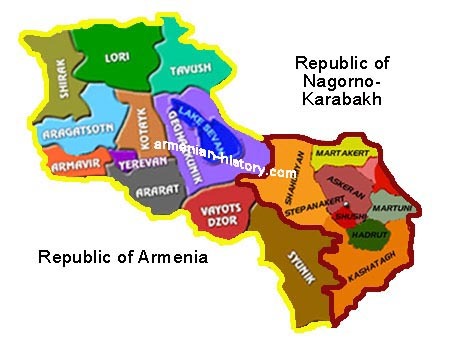 The name "Karabakh" is first mentioned in the 14th century. Geographically, it corresponded to the territory of Khachen principality. "Today it is called Karabakh and Mugan", a Georgian historian wrote. The sources testify that Mountainous Karabakh was one of the original provinces of Armenia regardless of the different names assigned to the territory in various periods of the history, and the Armenians have always been the aborigine population of Karabakh. As an eyewitness, Strabon evidences that during the reign of the Armenian king Artashes I (189-160 ) in Armenia "nowadays all these peoples speak the same language", i.e., Armenian. Stepanos Siunetsi, an Armenian poet and grammarian (VII-VIII centuries), indicating about the existence of the Armenian dialects in Armenia, wrote: "And for mastering the language one should be familiar with all dialects, such as the dialect of Korchaik and Tauk, Khut, and Fourth Armenia, and Sper, and Siunik, and Artsakh". One of the Arabic sources evidences that not long before the Mongol invasions when the troops of Jelal ad-Din intruded into Transcaucasus, Armenian prince of the Artsakh principality Hasan-Jalal, the founder of the famous Gandzasar Monastery (1240) was released from the threats of Sharaf al-Mulk who was moving to Transcaucasus for collecting taxes. The prince paid the lump sum tax and set free the Moslem prisoners: "(Sharaf al-Mulk) stopped near Khachen Fortress where Jelal ad-Din, the nephew (the son of his sister) Ivaneh al-Kurjhi was residing. Sharaf al-Mulk assailed him with threats until an agreement was reached under the condition that 10,000 dinars would be paid to Sharaf al-Mulk and 700 Moslem prisoners would be released that had been captured a various periods. Among the prisoners there were some elderly people that had been taken hostage in their childhood." Despite the fact that during the period of the Mongol invasions (1236-1350) the Artsakh rulers obeyed the Mongols and participated with their armies in the military campaigns against the Seljuk tribes, they successfully maintained their internal independence. Khokhanaberd Fortress was the center of the Artsakh Principality (near Gandzasar Monastery). In the 1380s' Transcaucasus was attacked by the hordes of Temur-Lenk (Lenk-Temur) from Central Asia, and before 1405 Artsakh, as well as the entire region suffered from the consequences of the disastrous attacks of Timurids who conquered basically the lowlands and more fertile areas of the Armenian uplands. Hans Schiltberger witnesses in his "Travel": "I also spent much time in Armenia. After the death of Tamerlan I was brought to his son who reigned over two kingdoms in Armenia. This son of his by the name of Shah-Roh was in the habit of spending his winter in a large plateau called Karabag which was notable for its good pastures. It is irrigated by the River Kura which is also called Tigris, and the best silk is obtained from the nearby areas of the river banks. Although the plateau is situated in Armenia, it belongs to pagans to who the Armenian population is obliged to pay taxes. The Armenians always treated me well, because I was a German, and, in general, they are well disposed towards the Germans or as they call as, the Nimitses. They taught me their language and gave their "Pater noster" to me. As opposed to several other regions of Armenia which were under the rule of Turkey and Iran in the XVI-XVIII centuries and where the feudal class was basically devoid of hereditary feudal rights, the Artsakh and Siunik meliks (princes) maintained their relative independence and domains, especially in the mountainous regions, and had their regular armies. 1. Giulistan Melikdom with its center situated in Orekavan (Talish) and the fortress of Giulistan, stretched between the rivers of Kurak and Tartar. In the XVI-XVII centuries the catholicos of Gandzasar was the uniting link for the successive rulers-princes of Artsakh. He often represented the meliks in the negotiations with the neighbouring states. Thus, according to the Georgian historian Parsadan Gorgijanidze, in 1631, during the negotiations with the Georgian king Teimuraz I the catholicos of Gandzasar was the first to offer the 40,000 Artsakh army for the joint military campaign against the Persian supremacy. This is not the only evidence of the significant role of the catholicii of Gandzasar. In 1672 the catholicos of Gandzasar Peter who, despite the clerical traditions, called himself "the catholicos of Armenia" (this title was the prerogative of the Echmiadzin catholicos) for the mere purpose of emphasizing the ethnic origin of his flock rather than challenging the existing hierarchy in the Armenian church, requested the Russian Tsar Alexei Mikhailovich that he should protect the Armenian people and support the Armenian delegates who were on a visit to Moscow. The negotiations on liberation of Armenia from the foreign yoke initiated with the European countries were mainly based on the military forces of the Armenian meliks of Artsakh and Siunik. Israel Ori and Archimandrite Minas were the diplomatic representatives in Germany and Russia (their portraits painted by the famous Italian artist Giovanni Antonio Pellegrini are still preserved in Munich). Yesai Hasan-Jalalian, the catholicos of Gandzasar, and Nerses, the catholicos of the northern regions of Artsakh were also actively involved in the written negotiations with the rulers of foreign states. In particular, Yesai Hasan-Jalalian wrote appeals to Peter I for several times. Owing to the joint efforts of the Artsakh meliks attacks of the Ottoman troops were successfully confronted during 1722-1730. It was the period when Turkey took advantage over the weakened Sefevid state and the occupation of Iran by the Afghan troops, intruded into Transcaucasus and occupied Georgia, the Ararat Valley and the region of Azerbaijan in Persia with the center Tebriz. The regions around the Caspian Sea (Derbent, Baku, Gilian) were occupied by Russia. The Armenian regions of Artsakh and Siunik fought relentlessly for independence and more than once the Turkish troops had to retreat from Artsakh incurring with major losses. 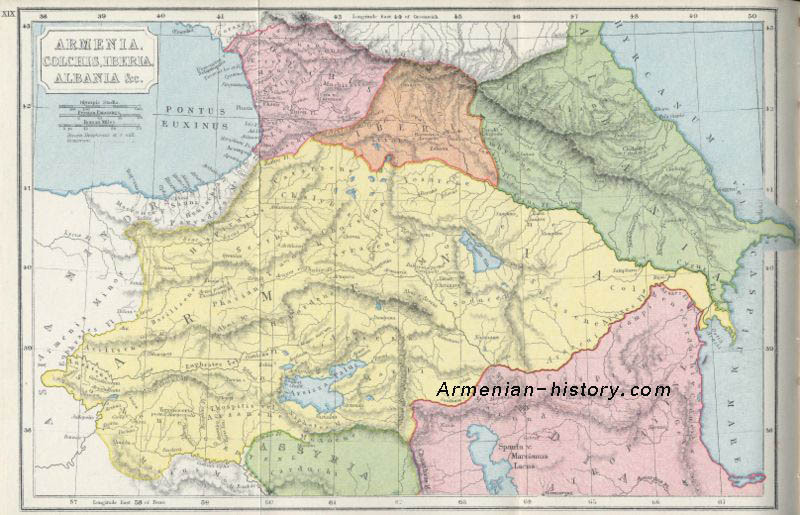 The occupation of Transcaucasus by the Turkish troops which lasted ten years (1723-1732) was fatal for those A rmenian-inhabited regions which were not controlled by the forces of the Artsakh meliks. In his letter to the Georgian King Vakhtang VI (dated February 5, 1725) Archimandrite Martiros from Derbent gives the list of those villages which were destroyed and forcefully turned into the Islamic religion during the Turkish occupation. The situation deteriorated due to the involvement of Ajhi Davud, a Turkish ally, in the political issues. According to I.G. Herber, who described the existing situation in 1728, "There lived more Armenians in Kabal than in the other districts, and did not suffer from the assaults of the offenders since they were rich and pay off big money to Khoja Davud and Surkhai. In 1727 the former khan in Shemakh appointed his son a satrap in Kabal who treated the Armenians with cruelty and tried to turn them into Mohammedan religion, and since they refused to disavow Christianity and withstood all tortures, they were forcefully driven into the mosque and cut. Then Khoja Davud ordered to announce that this was done against his will, and those who come to him with gifts will be free to confess their own religion. This is what the Armenians did and were permitted by the Khan to obey to their laws. They continued going to the church, but the Mohammedan clergy became angry with them and imposed fines on them as the apostates and stripped them from everything and again drove them to the mosques, and, thus, the Armenians in Kabal have forcefully become Mohammedans". This fact is confirmed in "The Description of the Locations Neighboring Georgia" by the Georgian King Irakli II: "The Sheki Khan was known by the name of Ajhi Chalab, and his father was an Armenian clergyman ( cf. : Abdul-Latif-Effendi, "History of Sheki Khans", Original and Translation, translated from the Turkish language by A. Dadashev, Baku, Publication of the Society of Investigation and Study of Azerbaijan, 1926, p. 5), but Ajhi Chalab confessed the Mohammedan religion and by some tricks became the ruler of Sheki which formerly used to be under the control of the Kakheti King, but was forcedly taken over by the Persian Shah Abaz I, and today many of the residents of Sheki openly follow the Armenian law and our Greek law with consternation". In 1734-1735 Takhmasp-kuli Khan (later known as Shah Nadir) was obliged to recognize the independence of the Artsakh meliks in their domains in the view of their adamant confrontation, as well as for the purpose of attracting allies. Thus, he acknowledged one of the noble meliks, Yegan as a Beklarbek, the head of Khamsa (the five Armenian melikdoms). Melik Yegan died in 1744 and Aram became his successor. However, the latter ruled only for a one-year period. Melik Aram was substituted by his brother Yesai who ruled for 33 years. There is an inscription on the tombstone of Melik Yesai: "This is the tomb of Melik Yesai, the son of the great melik Yegan. He was appointed a prince by Shah Nadir. He ruled over the country of Dizak for 33 years, accomplished many feats and had numerous victories over the disbeliveers. He was more courageous and decent than any of his ancestors. He died at the age of 61, in the summer of 1230 (according to the Armenian calendar), (1781) on October 2...". In his narrative about Karabakh in "Description" Irakli II mentions: "Khamsa constitutes the dominion and the entire population follows the Armenian rule. Also, it is the residence of the patriarch. And when the Persian shah died, a person of the Mohammed religion (i.e., Panah) of Jivanshir descent, took the power. There is an old fortress in the domain of Khamsa which was taken with slyness, and many times we had to fight against the people of Jivanshir, but with the divine help we always defeated them. In the view of several factors, presently a peace agreement has been concluded with them. The Armenians have a large fortress, mountainous landscape covered with forests, and, as a matter of fact, their fields are fertile. The Jivanshir army consists of 2500 people, while the army of the Armenians consists of 4500 ("Documents and other historical materials of the XVIII century related to Georgia" Vol. I, from 1768 to 1774. Edited by A. А. Tsagareli. St. Petersburg, 1891, pp. 434-435). In 1783, following the conclusion of the Russian-Georgian tractate, Irakli II presented to the Russian Tsar the list of the domains existing in Georgia and the neighbouring areas and their coats of arm. "The coat of arms of Georgia - a mountain with two arrows. The coat of arms of Kakhetia - Great Martyr Georgi on the horseback. The coat of arms of Shakon - fox. The original contains the signatory: IRAKLI". Although the coats of arms of Karabakh Khanate and Armenian meliks are not included in the list compiled by Irakli, other sources testify that that the Armenian meliks also had their coats of arms. The coat of arms of one of the meliks of Varanda contains Armenian monograms. A cupola of church with a cross is pictured above the head of the eagle. This is indicative of the fact that all of them had the status of independent political formations. In 1783 Russia had serious intentions to re-establish the Armenian statehood on the basis of Artsakh Oblast and to dissolve Karabakh khanate which was formed with the assistance of one of the Armenian meliks about 30 years ago. The plan was reported to Yekaterina II by Prince Grigori Potiomkin: "Without having the approval of Your Majesty, I passed the resolution on Ibrahim Khan of Shushi to Lieutenant General Potiomkin which calls for obedience. It needs to be considered in order to pass his dominion which is inhabited mainly by Armenians to national administration, and, thus, re-establish a Christian state in Asia, as promised by Your Majesty to the Armenian meliks though me". Karabakh, like Georgia, incurred major losses in 1795 due to the destructive military offence of the Persian troops under the commandment of Agha Mamad Khan, …in the Karabakh domain there lived about 40,000 Armenian households". In 1805 Ibrahim Khan began the negotiations with Russia under the pressure of the Armenian meliks and for the purpose of keeping his power. As the result, he was obliged to become the subject of Russia. However, in the following year he affiliated with Persia, because his had serious concerns about losing the power and guaranteeing future security for his family. For such action he was killed in 1806. A. Bakikhanov wrote: "Ibrahim Khan of Karabakh, who established friendly relations with the Persians, asked for assistance in his attempts to get rid of the Russian supremacy. His son Abiul-Fet-Khan moved with his troops from Kapan to Shusha. Abbas-Mirza crossed the Khudaperi bridge (across the Arax). Major Lisanevich, the commander of the Russian troops in Shushi at the midnight of June 2, 1221 (1806) charged against Ibrahim Khan who at that time resided with his family and servants in his camp behind the fortress. The Russians killed him and his wife, son, daughter, the sister of Selim Khan of Sheki and many of his servants and followers". "Their whole domain is called Karabag. The first melik is Jimshid, the son of melik Shahnazar whose province is called Varand and the fortress is Shusha. His son and a yuzbasha assist him. The second melik is Abov, the son of melik Joseph whose province is called Ikirmieort and the fortress is Giulistan. Abov drove out the major part of his population from that province, seeking for the mercy of His Majesty and settled them in Georgia under the protection of the Georgian King whose nephew melik Piridon is here together with the aforementioned melik Jimishid. The third melik is Rostom, the vicegerent of melik Mechlum, the son of melik Adam, and his province is called Charabert. The fourth melik is Abas, the son of melik Bakhtam, and his province is Duzag. The fifth melik is Alla-verdi, the son of melik Mirzakhan, and his province is called Khachen. The aforementioned meliks have yuzbashes, i.e., generals, in their service. Some of these generals receive this position by the right of succession while the others are appointed by the meliks as a recognition of their outstanding service". In the 19th century Shushi, the center of Artsakh ( V. Potto, "First Volunteers of Karabakh During the Period of Establishment of the Russian Dominion" (Melik-Vani and Hakop-Yuzbashi Atabekovs), Tiflis, 1902; V. Potto, "Heroic Defense of Shushi Fortress", Publication 2, St. Petersburg, 1903) became the third largest town in Transcaucasus where the Armenian culture and education flourished. Shushi had a major impact on the development of culture of the entire Transcaucasus, including the Tatar (later "Azerbaijani") culture.